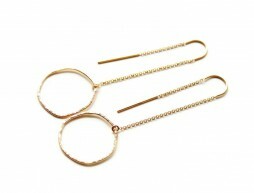 Long U top threader earrings, gold filled with organic shape circle links at the ends. Hammered organic links. Artisan hanmade jewelry. The total length of the earrings when on the ear is 2 3/4″ or 70 mm. Worldwide shipping from Toronto, Canada. 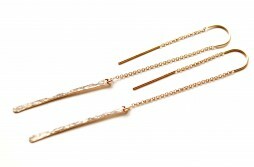 Long threader gold filled earrings with U-tops. Hammered bar earrings, extra long. Modern jewelry. Arc earrings in gold filled. 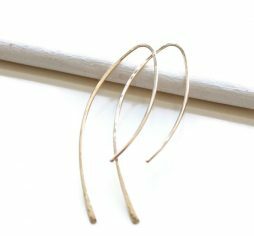 Minimalist style earrings. Minimalist long arc shape earrings in gold filled. Everyday wish bone earrings, gift for her. Curved long earrings. Earrings are made from 14k gold filled wire. Hand-forged, curved in an arc shape and hammered at the front end. The length is 2″. Handmade Horseshoe Necklace. Mixed Metal – Gold filled and Oxidized sterling silver. Hammered 1″ gold filled horseshoe on an oxidized to black sterling silver chain. Ships worldwide from Toronto, Canada. Ships in a gift packaging. 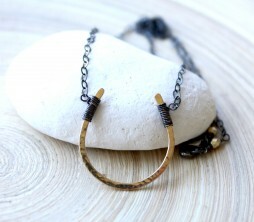 Handmade Lucky Horseshoe necklace in Copper and Black Oxidized silver, gun metal chain. made to order necklace. 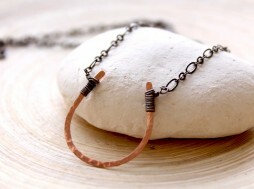 Hammered bright copper horseshoe, about 1″, wire wrapped in oxidized silver wire and finished with gun metal chain. Necklace will arrive in a gift packaging.